NOTE:We have found he length of pto crankshafts vary by manufacturer, model and from motor to motor within models. This is an area to pay close attention to, as the length of the crankshaft affects the internal side clearance of the clutch. If needed shim washers and spacers are included. These parts can be used to adjust your side clearance in the range of .010” to .025”. The exploded view of the clutch shows where to position the spacers. In some circumstances it may be necessary to trim the length of the key. In all circumstances the cutaway area of the key must fit under the sprocket bearing. Model Applications - The 1” Turbo clutch is designed expressly for use on high torque 4 stroke racing engines that utilize a 1” PTO shaft. Spring and weight combinations may be interchanged to suit the individual application. As you make your selections be aware that the heavier the weights and the stiffer the spring, the more positive the engagement becomes. Stiffer springs are springs with a larger wire diameter and they will give higher stall speeds. 1" Turbo 4 disc 6 spring clutch. Crank spacer for 3 and 4 disc 1" Turbo clutch. 1" shaft, 14 tooth #35 sprocket. Fits 098-305 basket. 1" shaft, 15 tooth #35 sprocket. 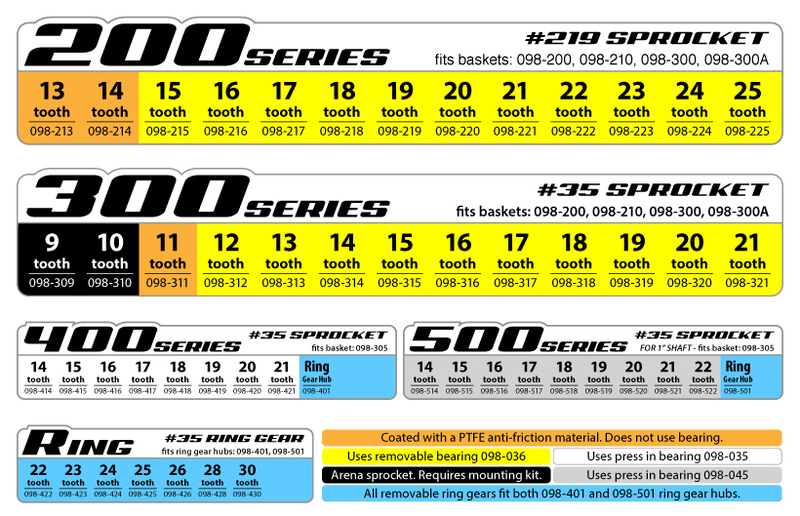 Fits 098-305 basket. 1" shaft, 16 tooth #35 sprocket. Fits 098-305 basket. 1" shaft, 17 tooth #35 sprocket. Fits 098-305 basket. 1" shaft, 18 tooth #35 sprocket. Fits 098-305 basket. 1" shaft, 19 tooth #35 sprocket. Fits 098-305 basket. 1" shaft, 20 tooth #35 sprocket. Fits 098-305 basket. 1" shaft, 21 tooth #35 sprocket. Fits 098-305 basket. 098-601 - Inner Thrust Bearing - 1"
Inner thrust bearing for 1" shaft. 098-602 - Inner Thrust Washer - 1"
1" shaft inner thrust washer. 2 required, sold individually. 098-603 - Outer Thrust Washer - 1"
Outer washer for 1" Turbo clutch. 098-604 - Retaining Bolt - 1"
098-605 - Short Steel Retaining Washer - 1"
098-607 - Long Steel Retaining Washer - 1"
Steel retaining washer for 1" Turbo clutch. Long. 098-611 - Stepped Key - 1"
Stepped key for 1" Turbo clutch. NEW STYLE 4 DISC. 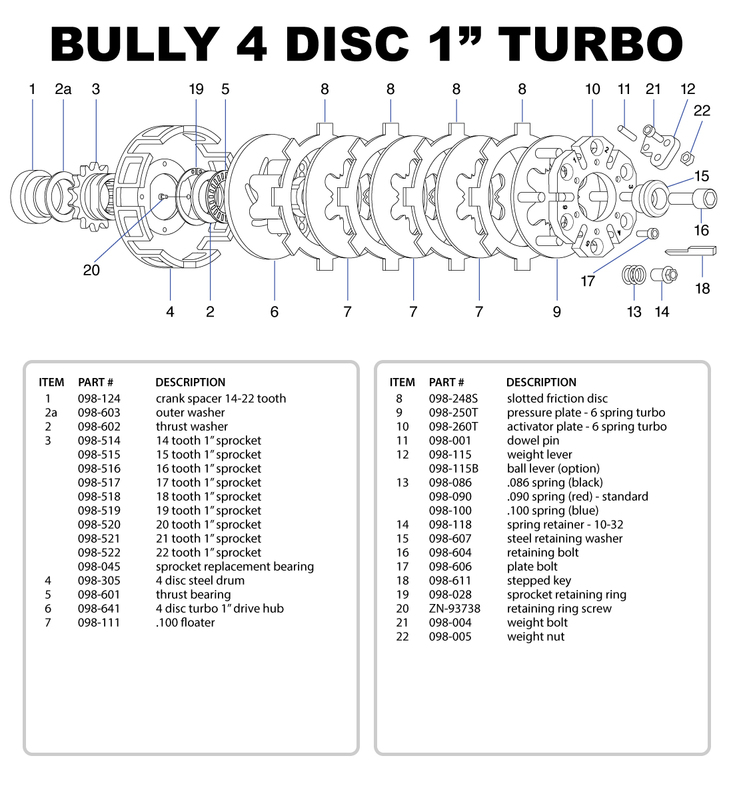 Drive hub for 3 and 4 disc, 1" Turbo clutch.